Another year, another book? It certainly seems that way. 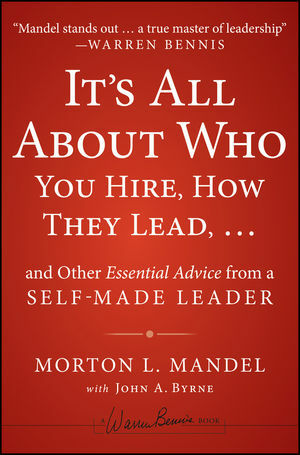 This week, Jossey-Bass published by latest as part of its prestigious Warren Bennis series: my collaboration with Mort Mandel called It's All About Who You Hire, How They Lead...and Other Essential Advice from a Self-Made Leader. 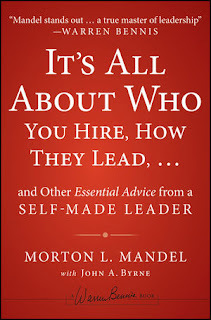 Now leadership books are a dime a dozen, but this one is special--and not because I was involved in its creation. Over the course of a long career in journalism, I’ve met and interviewed many of this generation’s greatest corporate leaders: Jack Welch, Andy Grove, John Chambers, A.G. Lafley, and Jeff Immelt, among countless others. Then, one day out of the blue, I received a telephone call from a friend who asked me if I had ever heard of Mort Mandel. I had to confess, I hadn’t. But the phone call led to a meeting and then to numerous interviews and the book that came out this week. Management sage Peter Drucker once put Mort in the company of Andy Grove and Jack Welch. I think he did Mort an injustice. Unlike a Jack Welch, an Andy Grove, or a Lee Iaccoca, whose corporate achievements define their public personas, Mort has lived in two worlds all of his years: the world of profit and the world of social impact. Even as the chairman and CEO of a New York Stock Exchange Company for 34 years, he was spending as much as a third of his time in the social sector. Mort strongly believes that his experience in the social sector made him a better corporate executive, just as he is convinced that what he learned in business made him a more effective social capitalist. It’s important to note that Mort isn’t an executive who lends his name to the board of a non-profit and shows up occasionally for a meeting or two. Rather, he has been a true social entrepreneur, with his time and his money, founding, either alone or with others, more than a dozen non-profit organizations, mostly serving the general community. They’ve worked to improve the quality of professional leadership in the social sector, to rehabilitate the inner cities, and to revitalize Jewish education around the world. What makes Mort unusual, if not unique, is his selflessness in pursuing a life of purpose. From his earliest days, he understood that there was much more to a successful life than building wealth—though as a self-made billionaire his is a quintessential rags-to-riches story. Mort understood that a life without meaning, purpose and commitment isn’t a life at all. So he devoted a large share of his time to combat human misery by bringing leadership to social causes. As a writer, helping Mort tell his remarkable story, it would have been easy for me to lapse into a modern-day version of Horatio Alger. After a childhood spent in the most humble of circumstances, Mort and his two older brothers scraped together $900 in 1940 and went into business as a distributor of auto parts. From a Cleveland storefront on Euclid Avenue, the brothers build Premier Industrial Corp. into a national company that by 1960 went public and in 1964 was listed on the New York Stock Exchange. For 34 out of 36 years, under Mort’s leadership as CEO, and making all major decisions jointly with his brothers, Jack and Joe, Premier reported record earnings and became extremely profitable, selling what many would consider fairly humdrum products—nuts and bolts, circuit breakers, chemicals, lubricating oil, and fire-fighting equipment. I'm fast approaching the one-year anniversary of the launch of PoetsandQuants.com, the first of two websites created by my own company, C-Change Media Inc. And one of the more gratifying aspects of doing something on your own is seeing the response from people all over the world to your work. The web is a great place to measure your impact because there are a wealth of statistics that tell you in real-time exactly how you're doing. With the one-year anniversary just a month away, we're fast approaching the five-million-visitor mark for our first site. But the most fascinating part of all this is seeing who is coming to PoetsandQuants for our coverage of graduate business school education and the MBA world. It's humbling for me to see that four of the top ten cities drawing traffic to my site are outside the U.S.: Bangalore and Mumbai in India, London, and Singapore. Last week, I had an SEO consultant take a look at the site's underlying performance. His verdict: On a scale of 1-to-100, PoetsandQuants.com got a grade of 99, meaning that of 3.6 million measured sites, it came in among the top 24,000 websites in the world. Not bad for a site that creates high-quality editorial for a rather small subset of the world's population. Only a few days ago, I heard from a friend who had traveled to Saudi Arabia on business. From his hotel, he tried to access our first website, PoetsandQuants.com, and couldn't get through. It was blocked by the government. I was as surprised as anyone by the news. After all, the site isn't commenting or encouraging any of the uprising across the Arab/Muslim world. It isn't a public policy or political site. It doesn't voice Democratic ideals, freedom of speech, or any other rights, privileges or responsibilities we all take for granted in the U.S. The site is about graduate business education, for goodness sake. The stories are on business schools, MBA programs, students, faculty, and corporate recruiters. The articles can be probing, but mostly on the value of an MBA degree, the increasingly higher cost of getting one, and the quality of the institutions that grant the degree. So why in the world would Saudi Arabia, or probably more likely some low-level censor in that country, want to block PoetsandQuants.com from Saudi citizens. And then I remembered a rather brief article we ran under the headline: "My Story: From Saudi Arabia to Wharton." Published last October, it's the first-person narrative of a young woman and her remarkable journey to the U.S. to pursue a world-class MBA. It tells the story of Shereen Tawfiq, the first ever female student from Saudi Arabia at Wharton, who courageously challenged centuries old cultural values rooted in male dominance. After graduating with an English Literature degree from a Saudi university, Tawfiq wanted to, in her words, "do something challenging that could have an impact on life. But women employment was limited. The only options were found in women-only environments such as teachers at girls-only schools or tellers or customer service representatives at women-only retail branches of local banks." Tawfiq got lucky. The Saudi government began imposing quotas to increase Saudi employment at large institutions. A bank in Jeddah hired her to replace a poorly paid expat. She began an administrative job, worked hard and tried to get a better position as a credit analyst. But Tawfiq was rejected many times. As she told us, "the bank's management didn't say it was because I was a woman, but I think society just wasn't ready. I kept pushing and, at last, eight months later, I got the job. My manager congratulated me, yet he candidly told me not to look for any promotions. The business community wasn't ready to accept women and business owners may have felt uncomfortable dealing with them directly. 'I'm not willing to jeopardize the bank's reputation,' my manager said." All in all, it's the story of a woman who relentlessly worked to get ahead--and in fact managed to break through several barriers. It's an inspiring tale. And I suppose that's why Saudi Arabia has blocked my site: So other women in Saudi Arabia won't be inspired to rise above the prejudice and the traditions that have kept so many intelligent and thoughtful women down. Today was a big day for C-Change Media and yours truly. We finally launched our second website in the network. It was not "Slingshots for David," our upcoming site for disruptive entrepreneurs, as had been planned, but rather an extension of PoetsandQuants.com. 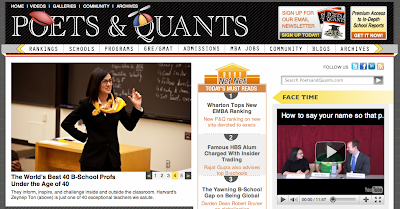 The truth is, PoetsandQuants has been such an outstanding success that it made more sense to build on the site's strengths and cover an adjacent and important market: education and training for executives. Thus was born PoetsandQuantsforExecs.com (above), what we hope will become a go-to place for managers and executives in search of personal growth in the form of an advanced business degree or a thoughtful non-degree course. 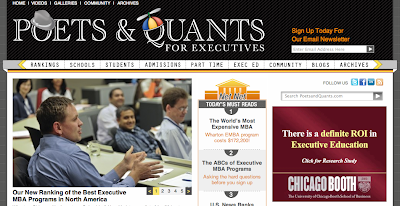 We debuted the new site with more than 50 stories and profiles, including a new composite ranking of the 50 Best Executive MBA programs in North America and plenty of people stories on how these executive students are balancing their work and home lives with the demands of getting an MBA from a top B-school. Our features will literally bring you around the world: we profile executives in Shanghai, Dubai and Norway who are enrolled in tough EMBA programs. We write about outstanding schools and unusual partnerships among them in Spain (IE Business School and Brown), London, and China. We found an extraordinarily diverse group of fascinating people pursuing the degree: a former opera singer at Columbia Business School, the mayor of Oklahoma City at NYU's Stern School of Business, an eye surgeon at Chicago's Booth, and a brain surgeon at Duke's Fuqua School of Business. And then there is the Microsoft executive who broke a cardinal rule for EMBAs: don't change much in your personal or professional life at the start of a rigorous EMBA program. She broke that rule twice, first by taking a more demanding job at Microsoft and then getting pregnant. 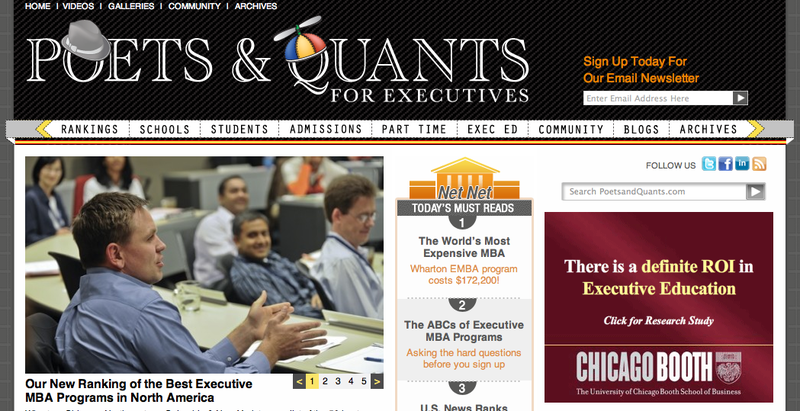 And just as we did at PoetsandQuants.com, the site is filled with analysis on the rankings and the value of the executive version of the MBA. We tear apart all the major rankings, examining each of their strengths and flaws. Embarrassingly, we found that U.S. News currently ranks Stanford as having a top-rated EMBA program. Oops. Too bad Stanford doesn't have an EMBA program. As always, our goal is to surprise and delight you with the stories we cover--but most importantly to inform in a way that helps you make an important decision in your professional life. We hope you like the new site. Same look and feel (see below our first site). Different content for a different audience. Google's latest decision to change its secret algorithms to reduce the rankings of trashy websites is a long overdue and important step to improve the company's core product: search. But the bigger problem with Google is not how spammers and low-quality web publishers have figured out how to game Google's search results, something I wrote about in August of last year in "Google? Where Are You?" and "Bing vs. Google: Guess Who Wins?" What has really eroded the company's dominance in search is good, old fashioned competition from new innovative rivals. Social search, in the form of Facebook, Twitter, Stumbleupon, Reddit, Business Exchange, etc., has significantly and steadily diminished the relevance, value and usefulness of Google search results. All of these web enterprises have used social curation as the killer algorithm to make Google search less competitive. What your offline and online friends recommend to you is far more valuable than what an impersonal, mathematical equation spits out. This remarkable development isn't only important to users of search; it's a highly valuable insight to anyone in the high-quality content game. My own experience with a now six-month-old website, PoetsandQuants, clearly demonstrates the power and the superiority of social search over Google's gamed algorithm approach. As readers of this blog already know, PoetsandQuants is devoted to the coverage of graduate business education. The stories on the site are substantive and thoughtful. They tackle all the meaningful issues confronting this business, from the impact of globalization to the value of an MBA. They provide highly useful and relevant information to help people make an important decision, requiring an investment of more than a quarter of a million dollars, in their professional lives. So what does six months of traffic data at PoetsandQuants tell me about Google? The results are not merely shocking--they are nothing less than an indictment of Google's effectiveness in search, clear proof that Google is living off its earlier laurels that allowed it to become the world's preeminent search engine. * Facebook, with fewer than 500 active monthly users on our P&Q page, has referred 12 times the number of visitors to PoetsandQuants than Google in the past six months and is gaining more ground--not less--as a key referrer in the past two months. * Twitter, with 2,000 followers on the P&Q feed, has referred nearly 10 times the number of visitors to PoetsandQuants than Google over the same period. * Business Exchange, a social curation product I helped create at BusinessWeek, has referred nearly 11 times the number of visitors than Google. * Even more damning, the number of referrals from Google during the site's first six months is only 25% more than two press releases we've published on PRWeb. What has happened to Google is an all-too-familiar problem that plagues so many companies that become big and successful: Awash in cash, they begin pursuing all kinds of other opportunities, neglecting the core product that established their greatness. Those opportunities ultimately become distractions that lead to a company's serious decline. Competition emerges to take advantage of the neglect. The incumbent pretends all is well and benefits from both the dominant lead is already has and the long lag time that it takes more nimble and innovative Davids to slay the Goliath. We are seeing the early stages of this battle which has been in force for at least five years. The Davids have been hitting the Google Goliath on a fairly consistent basis, shots to the body that bruise but rarely penetrate. This Goliath is still on its feet, but Facebook and Twitter have scored such big hits over the past three years that the giant is beginning to sway and stumble. So now that PoetsandQuants is well on its way, we're working on the design of our next website: Slingshots for David. The idea is simple: it's a site to provide tools and ideas to help entrepreneurs. Sure, there are lots of sites aimed at the small business and entrepreneurship market. Our Gypsy Rose Lee gimmick is to examine entrepreneurship from the perspective of the disrupter. So our lens will be disruptive business models and the disrupters themselves: How they think? How they create disruptive models to compete? What we can learn from them? Which leads me to this: What do you think of the logo above? I'm happy to report that Google has finally discovered the PoetsandQuants.com needle in the Internet haystack. It seems that the world's biggest search engine began listing direct links to the site yesterday--12 days after PoetsandQuants went live. Interestingly, unlike Bing, the direct link shows up as the fourth result on page one after you Google "poetsandquants." The first mention? A blogger from India who noted that a post of his was on our site. The second and third results point to the Twitter feed for the site. And then finally, in the fourth place, is the direct link.